Allow me to introduce you to our new Oliver + S fall pattern, which is actually an updated version of an old favorite. You might remember the Swingset Tunic + Skirt, which was part of our very first pattern release back in 2008. Many of you quickly discovered this simple skirt included in that style and fell in love with it. Well, we’ve updated it, expanded the size range, and made it available as an Oliver + S Singles pattern in both paper and digital format. What’s so great about this skirt? First of all, it’s a modified circle skirt. It’s not quite a full circle, but it has a wide sweep, which is great for twirling. Which is what so many girls love to do, don’t they? With this skirt, the hem really flares when you twirl. So I think that explains part of the love. These photos are making me homesick! Our models are sisters who are two of S’s best friends. We miss you, girls! The pattern also has an interesting method of construction which is simple but really effective. There are two narrow elastic casings in the waistband, and between the two elastics is a cute little drawstring that gets tied into a bow at one hip. So the waistband is interesting and comfortable and can also be adjusted. And the really fun part of the construction is that the skirt is fully lined, and the lining forms the casings, so it’s really easy to sew and to wear. The other thing that many of you have loved about this style is that it has the potential to be reversible. I didn’t write the instructions specifically to be reversible, but because of the lining and the construction, the skirt can easily be adapted to be reversible. And many of you have chosen to sew it that way, with some great results. So why re-release this pattern now, after all this time? Frankly, it’s because so many of you have asked for it. As your children grow, they outgrow our original patterns and size range. (The original Swingset pattern only went up to size 5.) 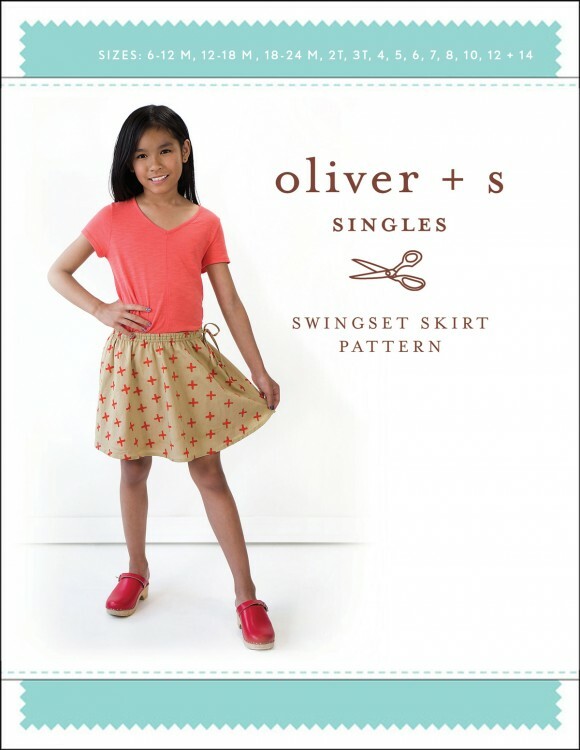 We thought that we’d try something different and release just the skirt as an Oliver + S Singles pattern with a complete range of sizes, from 6-12 months all the way up through size 14, which is a brand new size for us. So you’re getting a lot of sizes in this pattern, including the size 14 which we’ve never offered before. Which means that even if you own the original Swingset pattern, you’ll still get an additional seven sizes (and probably about nine more years of wear) out of this new pattern. Worth it? I hope so! Oh, and the best part? The price. It’s just $9.95 in either paper or digital format. Why just the one pattern for our fall release, you might ask? Mostly because we’ve been putting our focus for the last six months on a few other large projects. Between now and next spring you’ll see a new collection of fabrics, more Lisette styles, and a new book, which has been a big project that’s really been a labor of love for me. 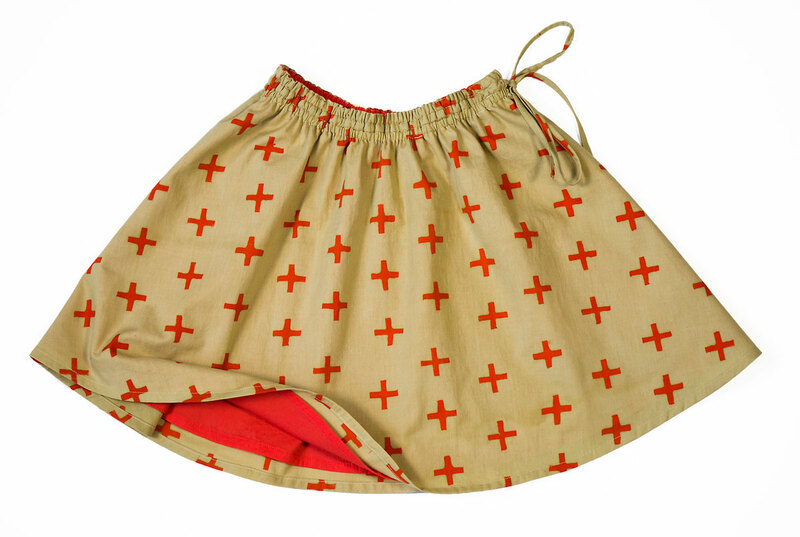 I hope you’ll have fun with this new Swingset Skirt and will enjoy the new sizes! I know quite a few of you will be really excited to have all these sizes together. The pattern is available in paper or digital format. I’ll show you some ideas for fabric selection and styling the pattern soon. So excited! My 6 almost 7 year old girl is outgrowing the old set of sizes and I’ve been wanting this for her! I actually noticed this single last night in the shop and almost got out of bed to buy it 🙂 But I figured it could wait til morning. We also love the swingset top, I know you have a lot of projects but any chance that might get sized up down the road also? I’m glad you waited until morning, Sarah. No pattern is worth getting out of bed for! We’ll have to see whether it makes sense to re-release any of our other older patterns. I’m hesitant to do it because our patterns always sell best in the first few months after we release them. And it’s always more fun to develop new styles. But if there’s enough interest in particular styles we’ll absolutely consider it. Cheers! I almost can’t believe it, but my 10 to gave me the go ahead for the skirt, she normally says no way on anything but tees and jeans. That last modeled photo sold it for her. Thank you for showing it with older girls, sometimes it can be hard for her to look past the little girls who usually model. I feel ya on the photographing, ha! My twins are young enough that I don’t have to consult them before sewing, so while the little girls pictures are adorable and I absolutely love them, I really appreciate the occasional older girl models. Absolutely! It’s a big collection. Details to come soon. I’ve always loved this skirt but have yet to make it. And a new book??!! Yay! Yay! I can’t wait to try this one! YES! This is so exciting, I love that skirt and it looks great on older girls! It’s such a fun one to play with, fabric/ribbon wise. Thank you thank you!! Thanks, Kristin! Glad you’re happy with it. Thank you so much!! My girl is now wrari.g the size 5 and I was so upset that this could be her last year wearimg it. I hope that newer patterns will follow suit in size range as well! When will we see details on the new book too?? I just adore you last one! Love the chambray version with pom-poms! So cute. And I love that it goes up to size 14! Thank you! I’m glad you’re happy with it, Emily! Thanks for the kind words. Please, if you can would love to have the larger sizes for our girls who are not really ready for teen sizes or styling! Off to buy this one right now. I hear you, Alicia! Thanks for your support, and we’ll see what we can do! This is fantastic! I only just got the Swingset pattern and immediately made 2 of the size 5’s, And realised most of the girls I sew for were about to size out. And now they’re not! And I get ALL the sizes for $9.95! This is brilliant. As a mom with girls aged 13, 11, 6 and 18 mos., this magnificently addresses all my pattern issues! I would like it to be longer for my older girls, but I assume I can just add length to the bottom easily? Yes, you can absolutely add to the length from the bottom edge. Or reduce from the bottom edge as needed. Here’s hoping there’s enough demand for more tween/teen sizes! thank you all for the new Swing Skirt sizes – such a great pattern, and a great go-to for many sorts of fabrics. Thank you for the Adult patterns in paper, too. I don’t have space big enough for ‘adult’ size downloads – ie pasting them together. So glad you have lots of creative irons in the fire. 6 months is another long time to wait for more of your wonderful ideas but I’m looking forward to experimenting with the Garden Party, the Carousel, and the Hide and Seek, in the Aussie Spring/summer. Just today I bought some slubby denim for skirts/shorts. So hope the next few months go well in Spain. I’d love to see a skort for those little girls who can’t help but go out and hang upside down on the monkey bars. This one is great for one granddaughter but not so much for the other. Judi, you may want to try our Badminton Skort + Top pattern. Thankyou for releasing the swing set skirt in a larger size range. I know you have a lot of other projects, but was hoping you would consider releasing the swing set top in a larger size. 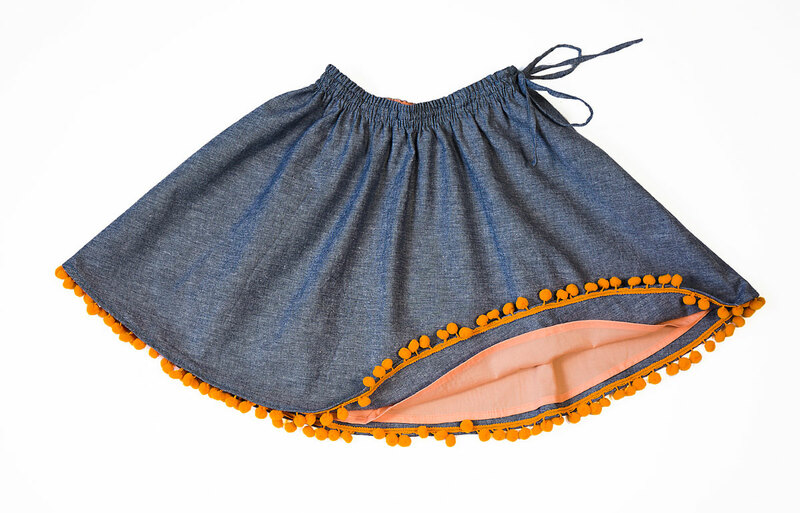 It was the first Oliver and s item I made, was worn to death and just perfect for our hot and humid summers.